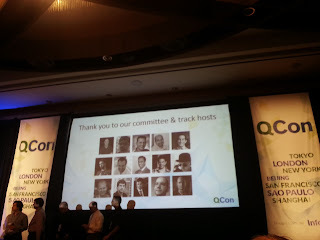 I have just returned home from San Francisco, where I and nine of my colleagues, spent 3 days at the QCon San Francisco conference. As often happens at these conferences, the gender diversity was not impressive - according to the speakers page, there were 7 women out of 110 speakers, and none of them were keynote speakers. This is, to put it mildly, abyssal, and we got to do better. On the last day of the conference, they displayed a slide of all the track hosts in the conference. When I saw it, I immediately thought to myself (and of course tweeted): I think I now understand the gender imbalance at the conference. At conferences like QCon SF, track hosts are heavily involved in selecting the speakers, and they tend to look at their own network when doing so. Unless you've done an explicit effort towards that not happening, your network tends to look a lot like yourself, and when people like the track hosts use their network to get speakers, the speakers end up looking like themselves. Not all track hosts are like that of course - one of the track hosts in that picture is Jez Humble, who is very much involved in fixing the gender imbalance (2 of his 5 track speakers were women), and who has written a great blogpost about this: How To Create A More Diverse Tech Conference. That blogpost should be required reading for all conference organizers, and certainly wasn't read (or at least not followed) by the QCon SF organizers. If the organizers don't want to follow the guidelines laid out by Jez Humble, then they could consider something as simple as trying to find a couple of female track hosts. That alone should help in the gender imbalance. Or perhaps just ask the vendors if they could use female speakers, rather than male speakers, on the vendors track, if possible - I know that at least one of the vendors had a great female speaker sitting in the booth on the first day, and she could easily have spoken on either the vendor track or in one of the other tracks. Before anyone goes on about conference organizers having to choose the greatest speakers they can get hold of, I will say that that has been addressed by Jez Humble in his blogpost, and that at QCon SF, the level of the speakers was generally sub-par compared to similar conferences I've been to the last couple of years (which includes both QCon London and QCon New York), so looking towards diversity probably would have increased the quality. Glad to hear you say that - all too often conference organizers will brush off concerns like one I raised. Thank you for not doing that.